Spectrum stained glass for hobbiest and artist building stained glass windows, lamps and projects. Purchasing Stained Glass Always purchase enough glass at the beginning of your stained glass project to complete it! Glass colors, like dye lots of fabric, can change from one shipment to the next, and you may not find exactly the same color match if you need more glass. In addition, glass manufacturers produce some colors as seldom as once a year. The colors displayed here can only be an approximation of the actual glass color. Please send a small sample if you are looking for an exact color match. Shipping Glass By UPS Glass for UPS shipping is cut to fit one of our specially designed, heavy duty glass boxes. PURCHASE Orders with glass sheets will be charged an additional charge for glass boxing. 1-13 sheets +$10 14-26 sheets +$14.50 over 27 sheets +$20 plus your UPS shipping charges. This glass boxing charge will be added to your INVOICE when we count and package the sheets. Glass sizes are approximate, colors will vary. About Spectrum The Continuous Ribbon Process During the 1920's, one of the most important technological advances in the history of sheet glass took place: the development of a production process called the "continuous ribbon." This new system took four separate phases of sheet glass production (raw material introduction, melting, sheet forming and annealing) and combined them into one continuous operation, making possible the production of large quantities of glass with very uniform and stable properties. Volume was boosted, costs were lowered, quality was improved, and the continuous ribbon became the heart of modern sheet glass production. Fifty years later, in 1976, the continuous ribbon was successfully adapted for art glass production. Three Seattle glass lovers with backgrounds in engineering noticed the increasing and unsatisfied demand for art glass. They gambled that it was technologically possible and economically feasible to create multi-colored glass in a continuous ribbon system, integrating old-world methods with modern glass technology. Their success became Spectrum Glass Company. In the Spectrum process, raw materials are introduced into a tank furnace, displacing existing molten glass and forcing it, stream-like, down a channel called the forehearth. At the end of the forehearth the red-hot liquid pours into a deeper pool, the stirring bay. Continuously moving, the glass flows from the stirring bay through a pair of water-cooled forming rolls, flattening into uniform thickness and becoming an endless ribbon of sheet glass. It is drawn directly into the annealing lehr, passing through a tunnel of 28 individual oven sections, annealing and cooling before emerging and being cut by hand into 48" lengths. This flow of glass from the primary furnace is either an end in itself (a smooth cathedral) or the base glass for the more complex products that Spectrum produces. Multi-colored glasses are achieved in a fascinating way, using a process that distinguishes Spectrum from all other sheet glass manufacturers. The secondary glass colors are melted in smaller furnaces located on a platform near the forehearth channel. As the base glass flows down the forehearth, one or more secondary glasses are ladled by hand into the stream. Then, at the stirring bay, the different glasses are carefully stirred together by a skilled operator using a hand-held rod. Of course, both the timing of the ladling and the stirring technique are critical to the end result, and vary for different products. Spectrum's popular "wispies" are made by ladling small amounts of white opal into the flow of a cathedral base. The denser "lamp-glasses" are just the opposite—small amounts of cathedral are ladled into a flow of opal glass. The semi-translucent opal mixes are almost half and half opal/cathedral and require a more strenuous ladle rate—as much as one jumbo pour every 20 seconds. The ladlers pour at carefully timed intervals, watching clocks equipped with timing lights to cue their movements. Stirring technique is very important. Inadequate stirring results in uneven distribution of color across the sheet. Over-stirring causes a muddy appearance and destroys definition between the colors. If the glasses are stirred too little, they tend to repel each other, creating splotchy areas and wide gaps in the mix. To complicate matters, many products, like Baroque, OpalArt and other specialties, require very different stirring techniques to create and sustain their unique characteristics. It's no wonder that the skills take years to master. The continuous ribbon has proven to be a surprisingly versatile tool for art glass production. Over the years, Spectrum's staff has learned to control and manipulate the process to create a myriad of special effects. Perhaps the most famous, Waterglass, is a natural textural effect created by over-stretching the vitreous ribbon as it is drawn through the forming rolls. Baroque is a true reamy glass, created by mixing together glasses of carefully mismatched compositions to achieve appealing waves and undulations. OpalArt is a one-of-a-kind specialty glass characterized by hightly exaggerated streaks and swirls, the result of highly developed stirring techniques. The continuous ribbon has no doubt become as important in the art glass world as it once was in the plate glass industry. 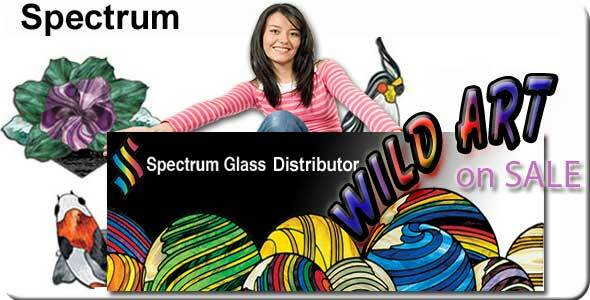 Spectrum has achieved the position of principal supplier of quality rolled cathedral and mixed opalescent glasses while continuing to inspire the market with new and unique art glass products. The innovative process made it possible. Patented in 1979, it remains the only one of its type anywhere in the world.